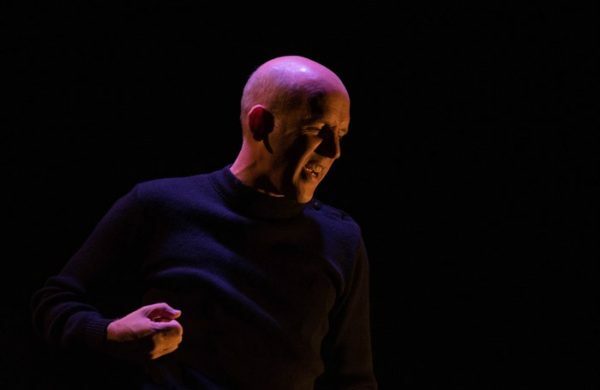 “It gets you in the pit of your stomach.” Verity Healey reviews Conor Lovett’s performance as part of Beckett in London. The End at The Print Room. Photo: Shane G. Mahon. Samuel Beckett’s short story The End is about an old man thrown out of a previously ‘caring’ institution who pursues a precarious living wandering through the towns in and around Dublin. Actor Conor Lovett’s droll delivery only adds more weight to the already heavy prose. Gare St Lazare’s take on this accessible, image driven staging, does not give us an old man per se though. Lovett’s life warrior, who seems not to want to live or die, is youthful, gregarious and even coquettish. His words tumble slick and glib out of his mouth as he narrates the man’s character-littered journey of struggling to keep a roof over his head. Lovett’s voice is honeyed, smooth and reassuringly gentle as he describes activities that can while away time when depression, poverty and loneliness set in. This includes contrasting masturbation with the ‘greater’ joy of slowly scratching one’s pubic hair, and relishing in the detailed descriptions of intrusions of fingers into certain bodily orifices. He describes a slow descent into decay and death set against a bleak landscape which only gets bleaker, greyer, darker and more difficult to climb out of. The effect is curious. Lovett both is and is not the old man. He narrates his experiences in mostly direct address to the audience with all the cheerfulness and bawdiness that might accompany a pub yarn. The audience is in fits, mostly because the actor creates a space which allows them to imagine, see, hear, feel and interpret for themselves the character’s experiences, and then laugh in recognition, embarrassment and/or empathy. We are not here in The Print Room in the Coronet, but in the cloister of the institution where he “must not loiter.” We pertinently imagine the realness of the man’s relationship with a wooden stool, the only object/subject against which he can measure his worth. There is both pathos and humour in the line “The rats came at me with such confidence”, which describes the only living beings that will dare approach the old man in all his dirt and rag-and-bone-ness. Lovett, with Judy Hegarty Lovett directing, also takes care to observe Beckett’s preoccupation with aporia, where ‘speech must always be in relation to silence.’ “In-the-street-I-I-was-lost” stumbles out of Lovett’s mouth punctuated by jerky pauses, and paints the clearest and most emotionally-felt image of a long imprisoned man let loose on now strange and unrecognisable streets. It gets you in the pit of your stomach. The actor’s physical presence also pays homage to Beckett’s particular brand of rueful, bitter sweet slapstick. At times, with his lumbering gait, heavy clog-like shoes, wide trousers, bulging eyes and sad face, Lovett’s a clown, miserably paring back the layers of Beckett’s sometimes caustic writing. Occasionally it feels like it is all a gag. But the time honoured “all clowns exit running” becomes something different in Beckett’s hands, something more stricken, more lonely, yet also tinged with relief. Lovett plays the roles as if he is surprised that he has spoken at all and the performance is utterly moving. And unmoving. Sad. Yet happy. Ugly but beautiful. It illustrates Beckett’s ambiguity and sometimes ambivalence to fate and fortune, life and death, having to breathe, having to bother. Lovett’s on a new discovery as he carefully listens to himself, realigns himself, thinks, pauses. This is when one makes the connection with time. The same performance has been done before, yet it feels this is the first. Beckett was always concerned with defining the fine line between the past and the present, how one is caught in both and between both. This production defines it perfectly, in a way that can’t be explained in words. Beckett in London at The Print Room is on until 5th June 2016. Click here for more information.